What a sweet baby girl. :) This little princess now has a great home, and she deserves it! She has a Maltese sister and a new, doting mama. I bet they are a happy, playful family! A Pomeranian guarantees it! 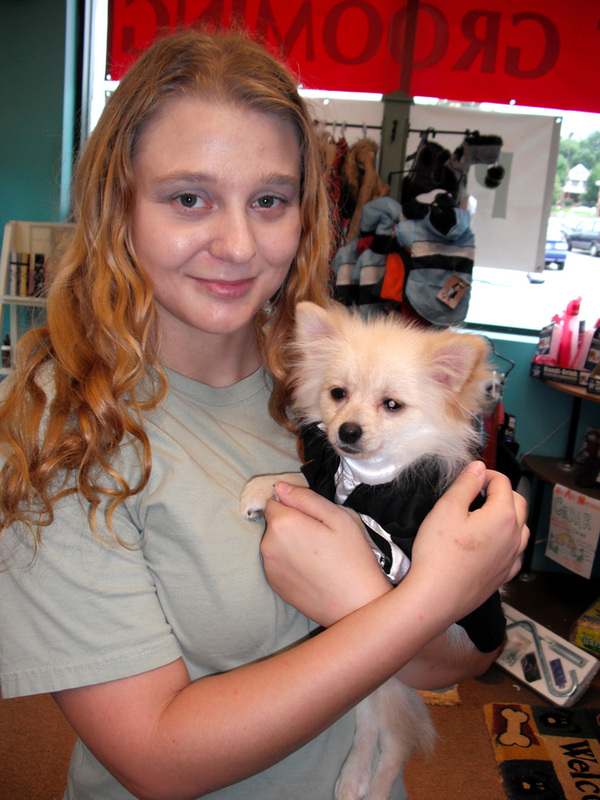 Check out this Pomeranian’s brother on our available puppies page, and then come meet him in person! We can’t wait to see you at the store! Hooray! Two pups in one day! Our little lady Dachshund found a home today. This beautiful dappled girl is going to a home with another mini dachshund. Just ask anyone… They are better in pairs! AND Our little Pommie guy, Chancho found a home, too! Now his name is Bowie. :) Keep an eye out for him sooner than later, because he is moving to Texas next month! Look at him in his little tuxedo! He’s all decked out for his big day! We’ve got lots of other precious pups here, though, including Ithaca’s beautiful brother! Come see our little doggies today! What a daring dog! 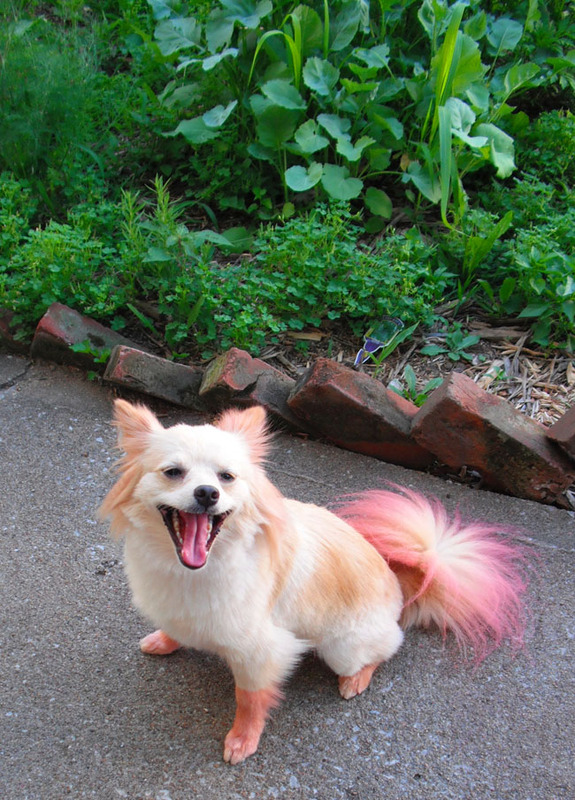 My Pomeranian, Fannie, looks fabulous in color. She was purple for Easter, and she got a trim and a sizzling new splash of red for this killer heat! It turned out to look like some intense shade of hot pink on her yellowish fur, but I think she looks adorable. We just put the dye on the end-half of her tail, her four little feet, and her ears (including her lengthy, naturally crimped fly-aways!). She was meant to look foxy, but she looks cute in any case, for sure! So I am a little behind! 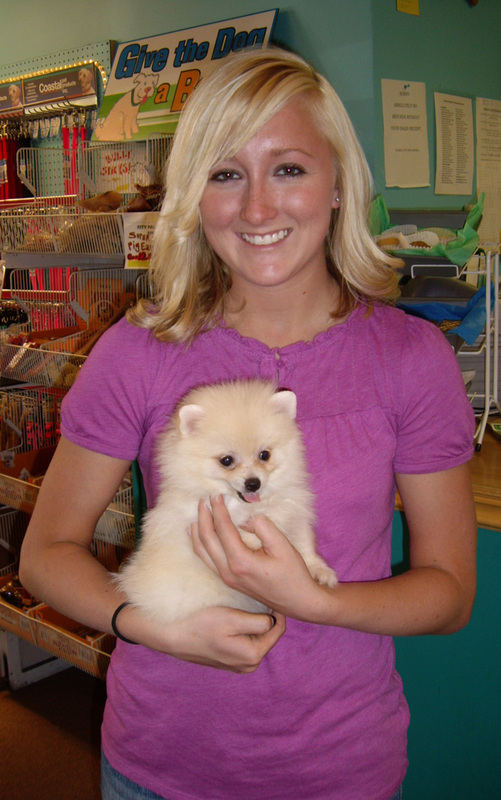 Ton-ton the Pom found a great home recently! Her new parents were both getting something special for themselves. Dad got a new iPhone, and Mom got a puppy! I certainly know who I think got the better deal! That puppy will be years and years of renewable joy. No upgrades needed for puppies. ;) What a lucky lady! Ton-ton’s brother, Chancho, is still here at the store looking for his forever home! Come by and see him today, and don’t forget to check out the Available Puppies page for pictures and info on ALL of our babies! Wow! What a beautiful girl! :) These folks made a great (and important!) decision to take this little Pomeranian home. 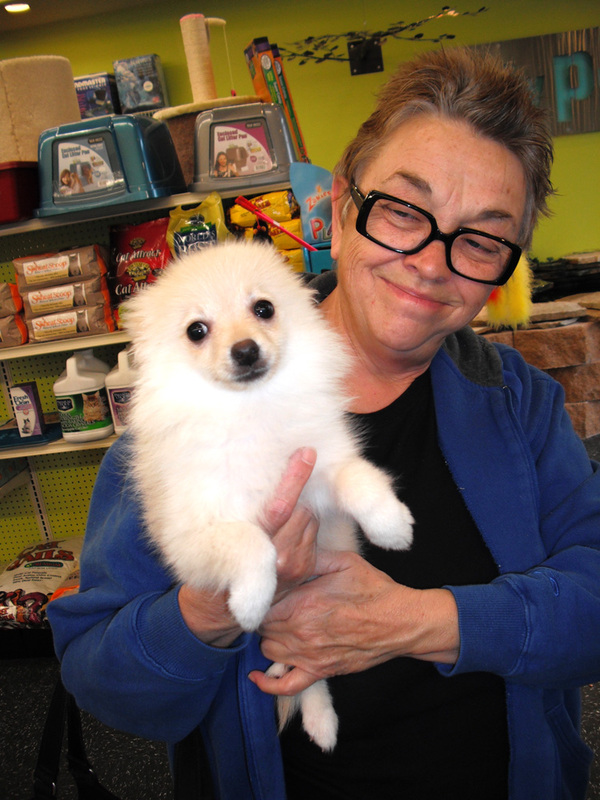 This customer knew she wanted this fluff-ball the moment she set eyes on her, and she had been looking at little puppies, and Pomeranians specifically, for quite a while! We are flattered and pleased that our pup was the one to make the cut! They even brought their 2-year old MiniPin, Monroe, to take part in the process. :) Here is a picture of the new happy family, Baby Pom Chloe with a cute pink bow in her hair! What a great picture! We can’t wait to hear more about Baby Chloe in her new home! See you soon! What a happy family. Henry’s owners could not tell us enough that he was a wonderful dog and the best puppy they could ever ask for. They tell us that he is content to just lie in their arms all day long. 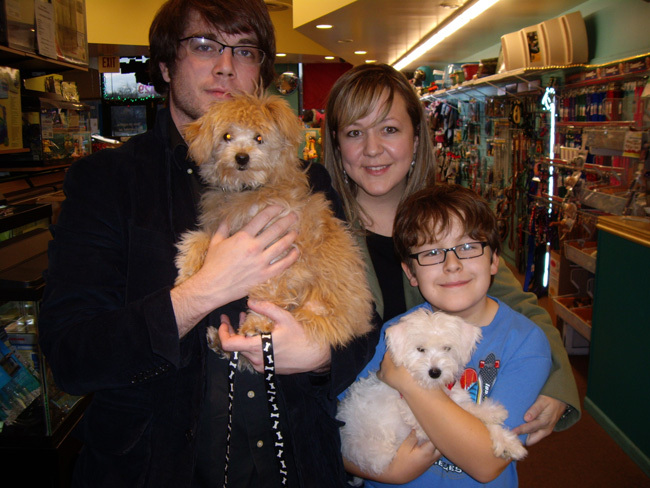 They hope that their new pup will help provide Henry with the fun puppy companionship that he needs! I hope so, too! Everyone have a wonderful time, and don’t forget to visit! My goodness! I’ve never found a puppy a home so quickly! This sweet little baby pomeranian JUST arrived at the store today. We had been expecting her arrival for about a month and had been in contact with this family, who were waiting for a chance to meet her. They came in this afternoon, just hours after she had arrived, and made the decision to take her home! Usually puppies at City Pets are kept in the back room, away from the public and off the sales floor, for several days to adjust to their new environment. But it made no sense to keep her here when she could go to her permanent home straight away! 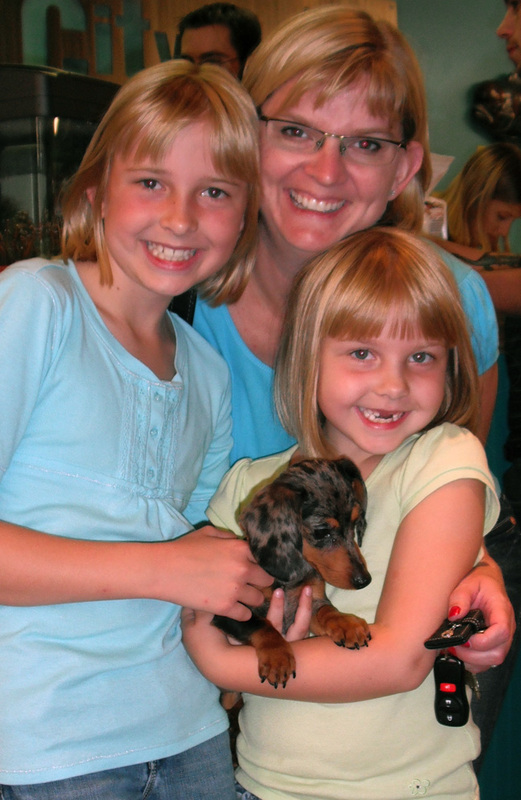 Plus, two of the members of her new family work for veterinarians! She could not be in better hands!